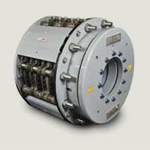 Wichita Clutch shipped its first AquaMaKKs brakes with composite water jackets in late 2008 and early 2009 to provide heavy-duty tension control on new mooring winches being installed on retrofitted offshore oil platforms in the Gulf of Mexico. The newest brakes in the Kopper Kool family were redesigned to provide up to 3,400 HP which is 35% more thermal horsepower absorption than the industry’s previous leader in the category. This is important as platform owners upgrade to larger anchoring systems to combat hurricane forces in the Gulf and throughout the world. The brakes are designed with a reduced part count for simplified maintenance and easier disassembly and reassembly. The non-metallic, composite water jackets are the first in the industry, and offer the best corrosion resistance available on a winch brake. Marine-grade materials and finishes are also standard which provide cost advantages over competitive units that require expensive optional equipment for corrosion protection in the harsh offshore environment. 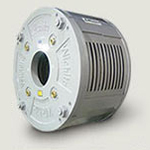 The AquaMaKKs shim design makes it easy to maintain and adjust for wear, and a unique mounting pattern enables direct replacement to Wichita or competitors’ units, requiring no design changes for the customer. The combination of new engineering solutions makes AquaMaKKs ideal for field retrofits, rebuilds or new OEM applications. In this application, the customer specified the 36-inch model with two copper wear plates. Designs with up to four copper friction discs are available, with optional HICO friction material that provides up to 50% higher torque. Wichita Clutch Kopper Kooled Brakes are used on semi-submersible oil rigs for both dynamic tensioning and static holding of mooring cables that keep the exploration rigs in position during drilling. These self-propelled platforms can drill to depths of 2,400 meters but must remain stationary for an extended period; thus a mooring pattern is laid with 8-16 heavy anchoring cables laid from each of 4 corners. For positioning, ships transport the anchor cables up to 6 km in length from the rig. In this dynamic mode, payout of the cables has to be controlled. The brakes control the payout of the cable at typical speeds of 40m/minute, generating 250 tons of cable tension. Each corner of the platform is typically equipped with two mooring winches which, traditionally, need two secondary brakes – one for static holding once the anchors are laid and another slipping brake to control the payout during mooring. Dual acting, water-cooled Wichita Clutch Kopper Kool brakes perform both functions. 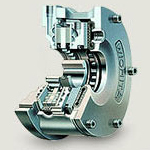 The result is that each corner winch requires only one secondary brake. Patented jacket design and copper wear plates provide precise tensioning/stopping capabilities with very high heat dissipation in dynamic mode. Once the anchors are laid, the multiple spring actuator in the brake is applied for static holding. Pneumatic disengagement of the static holding brake is designed as fail safe if issues arise during mooring. A	major	drawworks	manufacturer	asked	Wichita	to	provide	a	simplified, cost-effective	dual-function	braking	solution	for	use	on	land-based	drilling	rigs. In	response,	Wichita	supplied	an	AquaMaKKs™	water-cooled	brake	featuring	a dual-action	assembly	that	provides	both	spring-set	failsafe	parking	and	precision tension	braking	capability	in	one	unitized	assembly. The	application	required	a	primary	static	parking	brake	with	a	torque	rating sufficient	to	hold	750,000	lbs. on	12	lines. For	the	dynamic	tensioning	mode, Wichita’s	patented	balanced	flow	water	jackets	can	absorb	up	to	3,400	HP, allowing	faster	operation	when	compared	to	competitive	units. Wichita’s	unique,	non-metallic	composite	water	jackets	are	impervious	to	severe corrosion	which	can	be	caused	by	poor	water	quality	found	in	some	oil	field	brake cooling	systems. The	composite	jackets	also	provide	a	significant	weight	reduction compared	to	competitive	units	while	allowing	easier	handling	and	transportation. The	AquaMaKKs	units	utilize	copper	wear	plates	for	greater	heat	absorption	and require	only	one	type	of	friction	material	for	reduced	spare	part	inventory. The AquaMaKKs	dual-actuator	assembly	is	designed	to	allow	fast	and	easy	retrofit onto	existing	single	actuator	brakes	with	minimal	downtime. 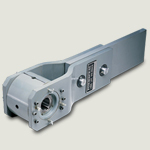 A variety of LLH model sizes are utilized at the facility with torque capacities ranging from 4,000 to 135,000 in.lbs. and maximum overrunning speeds from 130 to 400 RPM. The largest units are mounted on two conveyor systems with 60" wide belts that move 1,100 tons/hr on each belt.